Yukon Charlie’s Snowshoes are great for the beginer. They offer a quality product at a good price. If you are looking to go into deep snow or steep terrain though, these might not be the best choice for you. If you are just starting to snowshoe then Yukon Charlie’s are a good choice. Yukon Charlies was started in 1996. They have made a good name for themselves offering good equipment for snowshoeing adventures. Their Sherpa models are great for beginners or moderate locations that aren’t too deep or steep. If you are looking to explore more rugged locations then the Pro II model is a better way to go. These have steel crampons which will last longer when hitting rocks and climbing steep terrain. What’s Hot: Lightweight, great price, great quality for beginner. The Yukon Charlie’s Sherpa series are a great shoe for recreational beginners and those that enjoy trail walking. They are built with durability in mind providing a HDPE decking. They are lightweight but made with a strong 6000 aluminum frame. 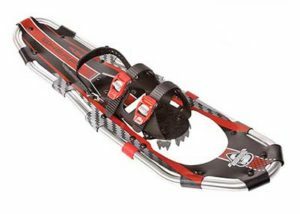 Also everyone loves the built in Double ratcheting binding that makes it easy for everyone and any brand of snow boot to strap into the Sherpa snowshoe. 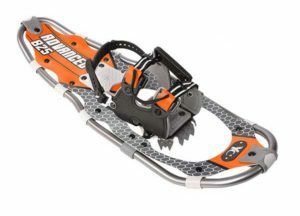 What’s Hot: Lightweight, good price, good traction with built in crampons. What’s Not: Rivets break easily. The Advanced series is another excellent value for back country hiking. These include powder coated crampons in both the front and rear for better traction on the trail. Slip these on and off with ease with the fast binding system, and never worry about them failing. Built out of strong 6000 aluminum and with SNOW MOTION™, this frame was built to last. What’s Hot: Lightweight, easy strap – one hand, heal adjustment. What’s Not: surface area slight less than average. What’s Hot: Lightweight, strap system easy and secure, heal adjustment, crampons. The Elite Spin snowshoe is the Yukon Charlie’s top of the line show. It takes all the great features from the Pro II and adds the SPIN™ by Northwave dial binding system. If you are into serious snowshoeing then the Elite Spin snowshoe will not disappoint. Like the Pro II the Elite Spin includes an upgraded heal lift to help ascend those steep inclines. Elite Spin series also includes upgraded crampons to help keep grip to treacherous terrain. What’s Hot: Floatation, strap system easy and secure, crampons. 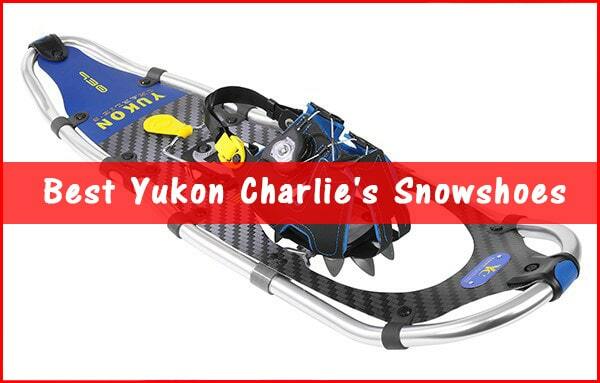 Another nice back country snowshoe by Yukon Charlie’s, the Carbon Flex series. 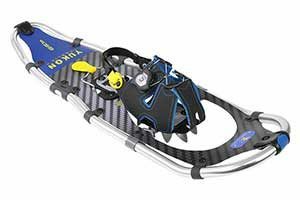 The Carbon Flex snowshoe is made using over-molding technology. This manufacturing process creates a shoe that is stronger and can handle the vibrations from trail walking better than other manufacturing methods. The Carbon Flex includes the SPIN™ by Northwave dial binding system like the Elite Spin series. 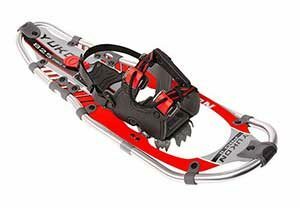 In addition to a strong frame, the Carbon Flex provides great traction with the inclusion of Mountain Claw II front crampon. 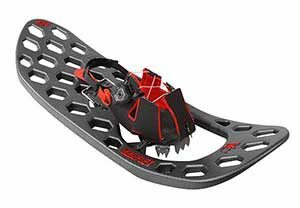 Not only does this snowshoe include front crampons but also SPIKE™ 8 integrated ice traction cleats. These will maintain some serious grip while on the back country trail.